Now, a new kind of rhyming dictionary—titled Surprising Rhyming—aims to make it easier for writers to avoid clichés and craft rhymes that people may not have heard before. Built on the findings of an in-depth study of the kind of ingenious rhymes used by some of the world’s greatest songwriters and lyricists, Surprising Rhyming offers an astonishing array of thousands of alternative rhyme options. It contains rhyme types that are much broader than those found in traditional rhyming dictionaries which tend to show only ‘perfect’ or ‘true’ rhymes. Using too many perfect rhymes can sometimes make a lyric or a poem sound tedious and predictable—and prone to clichés. To avoid this, Surprising Rhyming focuses instead on off-the-wall false-rhymes, half-rhymes, slant-rhymes and near-rhymes that are less predictable than exact rhymes—and therefore more likely to surprise an audience. The thousands of ‘surprising’ rhymes crammed into Surprising Rhyming’s 624 pages are based on analyses of the unconventional ‘imperfect’ rhymes that have been used by influential songwriters and lyricists such as: Chuck Berry, David Bowie, Sara Bareilles, James Bay, Leonard Cohen, Bob Dylan, Sia Furler, Hozier, Jay-Z, Billy Joel, Carole King, Michael Kiwanuka, John Lennon, Lorde, John Mayer, Joni Mitchell, Paul McCartney, Van Morrison, Bonnie McKee, Randy Newman, Dolly Parton, Christina Perri, Katy Perry, Ed Sheeran, Paul Simon, Stephen Sondheim, Taylor Swift, Cat Stevens, Bernie Taupin, James Taylor, Jimmy Webb, Lucinda Williams, Stevie Wonder … and many more. Surprising Rhyming is available as a paperback from Amazon in the United States, the United Kingdom and Europe. Read a FREE sample of the book HERE (United States) and HERE (United Kingdom). Ever since the official UK Singles Chart began in 1952, artists and bands have been competing to achieve the distinction of having a Christmas Number One. For 50 years, Christmas was the time of year for novelty songs, charity records and songs with a Christmas theme. But since 2002, the UK Christmas top spot has been dominated by reality TV contests such as The X-Factor and Popstars: The Rivals – with the winning acts often going straight to Number One in the week before Christmas. But during the rock ‘n’ roll years covered by SH-BOOM! – the 1950s, 60s, 70s and 80s – the Christmas Number One was always much less predictable. Actor and singer-songwriter Jeff Bridges, 61, who won an Oscar for portraying a rugged country singer in the 2009 film Crazy Heart, is set to become a hit country singer in his own right. His new self-titled album, produced by T-Bone Burnett, will be released by Blue Note/EMI on 16 August 2011. Dame Shirley Bassey has released her first full-length studio album in more than 20 years. Titled The Performance, the 72-year-old’s ‘comeback’ album features 11 new songs specially written for her by contemporary artists such as Take That’s Gary Barlow, the Pet Shop Boys, Manic Street Preachers, Kaiser Chiefs, Rufus Wainwright, and KT Tunstall. The album also includes a brand new composition by John Barry and Don Black – the first new song they have written for her since ‘Diamonds Are Forever’. Other key tracks include ‘The Girl From Tiger Bay’ (written by the Manic Street Preachers), ‘This Time’ (by Gary Barlow), and the opening track ‘Almost There’ (by singer-songwriter Tom Baxter). The Performance was produced by David Arnold, the Grammy Award-winning composer behind the soundtracks fo r five James Bond films. He says the album confirms the legendary Welsh singer still has the power to move an audience. In a career that has spanned 50 years, Dame Shirley Bassey has sold more than 135 million records and remains the only singer ever to record three James Bond theme tunes. In the space of a few weeks, first Madonna and Kate Bush turned 50 … then Michael Jackson. Pretty soon there’ll be dancing in the street “everywhere around the world” when Motown Records celebrates its 50th birthday on January 12, 2009. Universal Music – which now owns the legendary label – plans to get everyone in the mood for Motown’s half-century celebrations by launching a special 50th Anniversary CD on December 1, 2008. The new compilation will uniquely feature songs chosen by Motown fans themselves after they were invited to vote for their favourites in an online poll. Other Motown celebrations are being lined up throughout the whole of 2009 under the banner: Motown 50 – Today, Tomorrow, Forever. Berry Gordy Jr. founded the label as Tamla Records on January 12, 1959, with a loan of $800 from his family. The company was incorporated as Motown Record Corporation in 1960. Vocal group The Matadors were the first act to be signed to Tamla by Gordy. They went on to find fame after changing their name to The Miracles. By the mid-1960s, the groundbreaking Motown Sound had spread worldwide. And the label’s distinctive sound still resonates today – 180 Number 1 singles later – with Motown hits continuing to appear in TV commercials, TV shows and movies. British songwriter Steve Thompson – who has written songs for artists such as Celine Dion, Sheena Easton, Elaine Page, Sara Brightman and Elkie Brooks – has teamed up with playwright and poet Tom Kelly and photographer Peter Dixon to create an innovative multimedia album titled Voices. Voices features a unique fusion of evocative soundscapes composed by Thompson, moving poetry written and read by Kelly, and unforgettable images captured by Dixon. When creating Voices, the three artists collaborated virtually, using internet applications to evaluate and shape their ideas. The result, though, is more human than technological – and it’s highly original and emotive. All three artists’ work and lives are firmly rooted in the North East of England. Tom Kelly is a prolific Gateshead-based poet and playwright with many writing credits to his name. Plays like Baby Love and I Left My Heart in Roker Park have made him a firm favourite with North East audiences. Peter Dixon is a photographer from Jarrow who is famous for his moving images of urban dereliction. Steve Thompson has written such diverse hits as ‘Hurry Home’ by Wavelength, the Acid House dance track ‘Chiki Chiki Ah Ah’ by Baby Ford, ‘I Don’t Want To Be The One’ by The Search ers, and ‘Paris By Air’ by The Tygers Of Pan Tang. He was at the forefront of the New Wave of British Heavy Metal in the late 1970s and early 1980s, producing bands like The Tygers of Pan Tang, Venom and Raven. The result of the Thompson-Kelly-Dixon collaboration is a highly atmospheric piece which has just been released as a 13-track DVD. The Voices DVD is now available to buy for £10 ($20), including postage and packaging. For further information, visit: www.wmdjmedia.com. 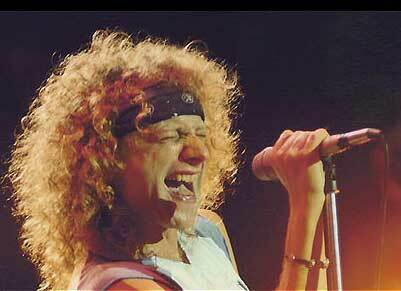 Former Foreigner lead vocalist Lou Gramm is set to release his first Christian rock album later this year. The album features brothers Ben, Richard and Don Mancuso from Gramm’s pre-Foreigner blues-rock band, Black Sheep. Gramm – who left Foreigner for a second time in 2003 – said his recovery from a benign brain tumour in the late 1990s had given him the inspiration for many of the album’s faith-based songs. But Gramm admits that his change of direction is receiving a mixed reaction from Foreigner fans and fans of his previous solo work. However, he insists that his creative approach hasn’t changed just because his new offering is a Christian rock album. Gramm and his band will be touring the US this summer, including selected dates with rock legends Boston. But they won’t be playing any of the new songs until the Christian album is released. Fans will be pleased to hear that Gramm intends to keep performing many of Foreigner’s hits “for the time being”. As powerhouse lead vocalist and songwriter with Foreigner, Lou Gramm exploded onto the international music scene with the chart topper ‘Feels Like The First Time’ in 1977. Says Gramm: “I was the lead vocalist for Foreigner for 26 years. I’m enormously proud of this – and the music I have made with Foreigner is still a big part of my solo shows. However, with my new band I can also perform my own music and the hit records I have had as a solo artist. I even throw a few curve balls, such as my take on a Beatles classic like ‘You Can’t Do That’. 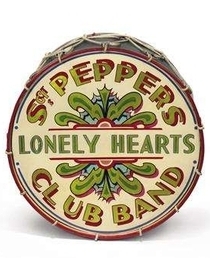 The iconic hand-painted drum skin seen on the sleeve of the Beatles’ 1967 album Sgt. 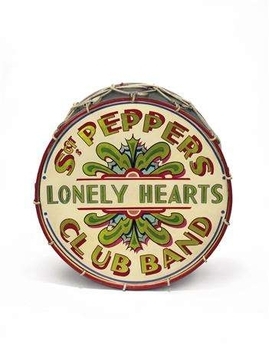 Pepper’s Lonely Hearts Club Band was sold for £541,250 at auction today – almost four times the expected price of £150,000. 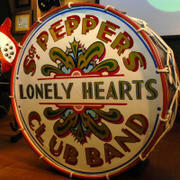 The drum skin – which was placed at the centre of the album cover – is believed to have been designed by fairground artist Joe Ephgrave. What is probably the world’s most famous drum skin proved to be the star attraction at Christie’s latest Rock and Pop Memorabilia sale in London. Another star lot was John Lennon’s handwritten manuscript for his song ‘Give Peace a Chance’. The lyrics sold for more than £420,000 – well above the pre-sale estimate of £300,000. The lyrics were sold by comedy writer Gail Renard who obtained them during Lennon’s eight-day “bed-in for peace” with Yoko Ono at Montreal’s Queen Elizabeth Hotel in May 1969. Lennon scribbled the lyrics on a piece of cardboard with a black marker before recording the song in the hotel suite with Yoko and an eclectic mix of personalities. Renard, who was only 16 at the time, says Lennon gave her the lyrics himself, telling her they would be worth something one day. How right he was! Also at the Rock and Pop Memorabilia auction, a rare 1968 recording of the Jimi Hendrix Experience performing at the Woburn Music Festival – at Woburn Abbey, Bedfordshire – sold for £48,050. A 1966 Marshall amplifier – used by Hendrix in concert between 1967 and 1969 – sold for £25,000, while a pair of his striped flared trousers made £20,000. A 1967 Gibson guitar previously owned by The Who’s Pete Townshend sold for £32,450. French first lady Carla Bruni is following the trend started by Radiohead by putting her entire new album, Comme Si De Rien N’Etait (As If Nothing Had Happened), online – five days ahead of its official release in the UK. The former supermodel wrote 11 of the album’s 14 tracks. Fans will be able to listen to her sultry love songs for free – until July 21 – by visiting her web site (www.carlabruni.com). The Italian-born singer-songwriter’s record label, Naïve Records, is said to have been working closely with Elysée Palace on the marketing campaign for the album. In an interview with French radio station France Inter, Bruni dismissed the media storm surrounding the album, saying she didn’t see why presidential wives should give up their jobs just because they were married. However, Bruni conceded that her position ruled out live concerts and there would be no tour to promote the album. But she pointed out that royalties from the album would be donated to charity. Carla Bruni recorded two albums before becoming half of the world’s most glamorous political couple after a three-month romance. Her first album was critically-acclaimed and sold two million copies, but her second English-speaking release, No Promises, sold less than half-a-million. Comme Si De Rien N’Etait – Carla Bruni. Released on 14 July 2008 by Naïve Records.